EAST END, Tortola, VI- Five months after Shermar Blijah Tylick Trim and Joi-Ann Nikia Thomas were crowned the 2016 Mr and Miss Junior BVI, Virgin Islands News Online can confirm that the two have not yet received their prizes. The two emerged victorious after a close to five-hour long battle in the Eileene L. Parsons Auditorium at the H. Lavity Stoutt Community College in Paraquita Bay; competing in Introduction, Swim Wear, Black and White Affair, Talent, Evening Wear and Question and Answer rounds on Sunday July 10, 2016. The event was spearheaded by the East End/ Long Look Festival Committee. The information about the prizes not yet presented was first brought to the attention of this news site by a concerned individual with first-hand knowledge of the matter. According to a source, the two were told that it was being worked on, however, no time frame was given and it is a waiting game. “Please note this has nothing to do with her [Thomas] as she said that she is not the type of person to be begging anyone for anything, this young lady has done so much already and no credit has been given to her. I think that it is time the committee got some light shined on them because it is over bearing,” one of our sources said. The source also added that Ms Thomas was supposed to participate in an international pageant; however, she was informed too late to attend and was even told to foot the bill. We were; however, unable to confirm this as when contacted the Chairperson of the organising committee, Sandra Potter- Warrican, flatly refused to comment. Thomas captured awards for Miss Popularity, Miss Intellect, Miss Congeniality and Best Talent, while Trim copped every award: Mr Popularity, Mr Intellect, Mr Congeniality, Most Poised, Mr Photogenic, Best Swimwear, Best Talent, Best Black and White Affair and Best Evening Wear. 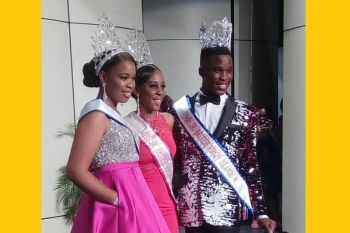 The first runner up position went to Dyese Turnbull, who swept awards for Most Poised, Best Black and White affair and Best Evening Wear, while the Second Runner up went to Dje’moyia Smith who took the award for the Miss Photogenic. We understood that among the items the Miss Junior BVI was promised were $1,500, electronic devices and a round trip to Puerto Rico. I have seen posts on facebook where Ms Jr BVI has been doing her duties and making appearances as queen....and with a smile! Your efforts are not in vain hun. The committee and the person/s responsible for providing these rewards should be ashamed! What a shame!!!!!. I love the young lady positive attitude, continue to hold your head high and smile. They are the ones who look bad. what about the other festival committees? I am glad they came forward because BVI this is nothing new. Why the hell Ms. Thomas ain't gone to her International show? Utter rubbish! This committee needs to be demolish. A set a crooks. The real person in charge is Marcy nothing more unfair than she when it comes to pageantry. Hon. Walwyn please take this pageant from these people and start a decent committee.